As high-demand applications such as ITU-R Recommendation BT.2020, Rec. 2020 or BT.2020), and ITU-R Recommendation BT.709 (Rec.709) both of which define ultra-high-definition television (UHDTV), and standard dynamic range/high dynamic range (SDR/HDR) conversions, chroma keying and artistic effects such as sepia, black and white or colour, FPGA IP provider, Omnitek, has introduced a 3D LUT for colour space conversions and conversion between non linear gamuts. 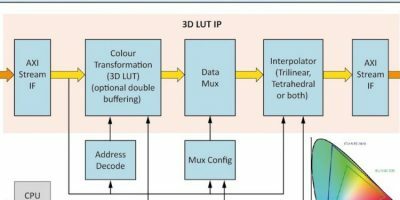 Implemented as IP for FPGAs or programmable SoCs, the 3D LUT makes efficient use of the resources on these devices to support real-time processing of up to 4K UHD video at 120 frames per second, using lookup table (LUT) sizes of up to 65 x 65 x 65 and a colour depth of up to 16 bits for both input and output. The scalability of the design supports alternative configurations including extension to 8K, adds Omnitek. The flexible nature of the FPGA means that the 3D LUT IP can support a variety of different standards, throughput rates and resolutions to suit different application requirements and budgets. There is also a range of additional functions available from Omnitek such as image signal processing, warp, blend and stitch. Using these, the 3D LUT can be integrated into a complete system design on an FPGA with connectivity options including HDMI, SDI and V-by-One, explains Omnitek. Omnitek specialises in the design of intelligent video and vision systems based on programmable FPGAs and SoCs. It supplies expert design services with highly optimised FPGA intellectual property cores covering high-performance video/vision and artificial intelligence/machine learning (AI/ML) for a broad range of markets. Omnitek also designs and manufactures a suite of video test and measurement equipment.